So now the plague of millennial “micro-aggressions” and mortal fear of emotional offense has reached across the oceans. And it has landed smack in the core of the so-called “country of tolerance” — the Netherlands — in the heart of the theoretically most openminded community — the art world — on earth. Here is the short version: an artist couple, Stefan Ruitenbeek and Kate Simha, who together go by the moniker Keeping It Real Art Criticism, or KIRAC, have built a controversial reputation for their videos and occasional articles that take on the conventions of the art scene, particularly in the Netherlands. One such video involved a conversation with one of Holland’s best-known (and also controversial) collectors, Bert Kreuk. In the interest of student education (presumably), the country’s top art school, the Amsterdam-based Gerrit Rietveld Academie, invited KIRAC to speak about the video. KIRAC, in turn, invited Kreuk, who accepted, and a date was set for February 8. Then the outrage started. On Facebook, students pointed to past videos and articles by the pair that they deemed “misogynous” and “racist” and demanded that the invitation be revoked — a situation that has played out any number of times in America in recent years. That the event at the Rietveld had nothing whatever to do with either racism, misogyny, or the subjects that had been addressed in those previous works was irrelevant. Sinha’s past allegation, in an article critical of Amsterdam’s Stedelijk Museum, that the curators had selected the artist Zanele Muholi for an exhibition because she was black, South African, and a lesbian, made Sinha a racist, pur sang. No one suggested it was a “racist comment” made by someone who might have thought better of it. No, with no further evidence of racism, Sinha was now “a racist” who had no business speaking at the prestigious Academie. 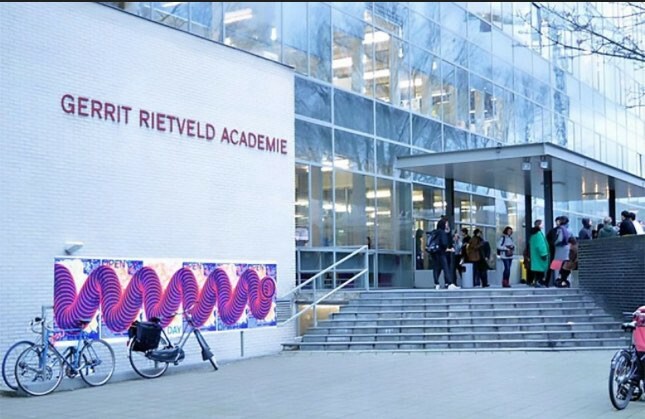 Alternatively, the Rietveld’s administration might have invited KIRAC to speak instead not about Kreuk and his art collecting philosophies, but about the role of free speech in art criticism, or about their work using art criticism as a form of art itself, or about racism and its true meanings, or any number of related issues. They might have encouraged a debate on any of these topics, all of which are relevant and important, and nowhere more so than in art. But they did none of these things. Instead, they cancelled the event. This predictably, only added to the frenzy. Local press seized on the story and fanned the flames of controversy. I wrote about it as well for Artnet.com. And just as my story was about to go live, the school announced a change in plan: they would invite KIRAC to come, not so KIRAC could discuss Kreuk and his collecting, or their about art criticism; no, the Reitveld invited them so that they, the Rietveld administration, could defend, in public, their position on the banning and censorship of the duo’s work. I ended the interview, instead. But everything, just everything, is wrong with this story. “I support the right to free speech but I don’t have to give a platform to it” is, in fact, a dangerous and frightening defense, one used far too often by those who would like to believe that they are liberal and open and believe in Voltaire and all that but in fact don’t have the guts. What it really means is: I don’t actually support it if it means I have to, you know, lend support. Or: Not In My Back Yard. Or: Sure, I don’t have anything against Muslim refugees, just not in my country. I don’t have to have them here. What is so difficult for these people to understand about the meaning of “free speech”? For an American, I tell Van Eenennaam, you can imagine how wrong this is. Free speech is free speech. If it is not free speech, it isn’t free. But even Americans have difficulty with this stuff these days. Non-controversial speech does not need to be protected, I mutter over and over as I type the story — the words I had not spoken aloud to Ms. Van Eenennaam. Free speech laws and ideals exist exactly to protect the speech we do not necessarily like. It takes a coward to defend the right to say nice things. It takes courage, and faith, and an open mind towards justice, to defend the rest. Or shall we return to a world where one may not speak against the Christian god, or display affection for someone of the same gender, lest it may offend? Who has the authority, anyway, to mandate what is or is not “offensive”? Isn’t breaking down the limitations to what offends and what does not exactly the role and life of art? And who is she, this administrator at a desk, to arbitrate, to adjudicate, what may or may not be said, what is or is not “crossing the line” of what is “right” or “wrong”? In those days, Manet’s style and treatment were considered as shocking as the subject itself. He made no transition between the light and dark elements of the picture, abandoning the usual subtle gradations in favour of brutal contrasts, thereby drawing reproaches for his “mania for seeing in blocks”. And the characters seem to fit uncomfortably in the sketchy background of woods from which Manet has deliberately excluded both depth and perspective. Le déjeuner sur l’herbe — testimony to Manet’s refusal to conform to convention and his initiation of a new freedom from traditional subjects and modes of representation — can perhaps be considered as the departure point for Modern Art. But in this art school, such revolutions, such controversy, such stretching of the boundaries, cannot be permitted. No, instead, the “tolerant” Dutch have, again, fallen into the same trap they’ve tripped into time and time again. They either tolerate intolerance (as they did in their indulgence of honor killings for any number of years before publicity forced them to crack down), or they hide inside the safe cocoon of tolerating nothing but themselves at all. Let there be no discussion of ideas. Let there be no disagreement about what good art is, and bad. Let there be no controversy in the playground. Here’s the irony: the great Dutch filmmaker Theo van Gogh, great grand-nephew of the artist, died for this. The cartoonists of Charlie Hebdo died for this. Exactly this. But the Dutch, celebrated for their alleged “tolerance” and “freedom,” have never really understood what freedom means.. Like the millenials across America, they lack the courage true freedom demands, or the humility to embrace it. Speech should be free, they say, except. Except speech that I don’t like. Except speech that needs the defense of freedom. This is the country where blasphemy laws were only struck down in 2013. This is the country where it remains a crime to speak against the King. Free speech? This is like calling the Jews in concentration camps “free” because they were not chained up to their beds. This is like calling prisoners “free” because they get to walk around the yard for an hour every day. On a tour of China in the 1970s, my parents visited a school. The teacher placed a yellow apple on a desk. The children were all to draw the apple. The apple that they drew may not be rounder than the apple on the desk. It may not be taller. It may not be red. Everything that was not just like the apple was wrong. This was how art was made. This was how minds were formed. Is this who we are now becoming, too?